The Graphical Modeler is a wxGUI component which allows the user to create, edit, and manage complex models using easy-to-use interface. When performing analytical operations in GRASS, the operations are not isolated, but part of a chain of operations. Using Graphical Modeler, that chain of processes (ie. GRASS modules) can be wrapped into one process (ie. model). So it's easier to execute the model later with slightly different inputs or parameters. Models represent a programming technique used in GRASS GIS to concatenate models together to accomplish a task. It is advantageous when user see boxes and ovals that are connected by lines and represent some tasks rather than seeing lines of coded text. Graphical Modeler can be used as custom tool that automates a process. Created model can simplify or shorten a task can be run many times and it can also be shared with others. Important note is that models cannot perform specified tasks that one cannot perform manually with GRASS GIS. It is recommended to first do process manually, note the steps (eg. using Copy button in module dialogs) and later duplicate them in model. Graphical Modeler can be launched from the Layer Manager menu File -> Graphical modeler or from the main toolbar . It's also available as stand-alone module g.gui.gmodeler. The main Graphical Modeler menu contains options which enable the user to fully control the model. Directly under the main menu one can find toolbar with buttons (see figure below). There are options like (1) Create new model, (2) Load model from file, (3) Save current model to file, (4) Export model to image, (5) Export model to Python script, (6) Add command (GRASS modul) to model, (7) Add data to model, (8) Manually define relation between data and commands, (9) Add loop/series to model, (10) Add comment to model, (11) Redraw model canvas, (12) Validate model, (13) Run model, (14) Manage model variables, (15) Model settings, (16) Show manual and last of them is button (17) Quit Graphical Modeler. There is also lower menu bar in Graphical modeler dialog where one can manage model items, see commands, add or manage model variables, define default values and descriptions. 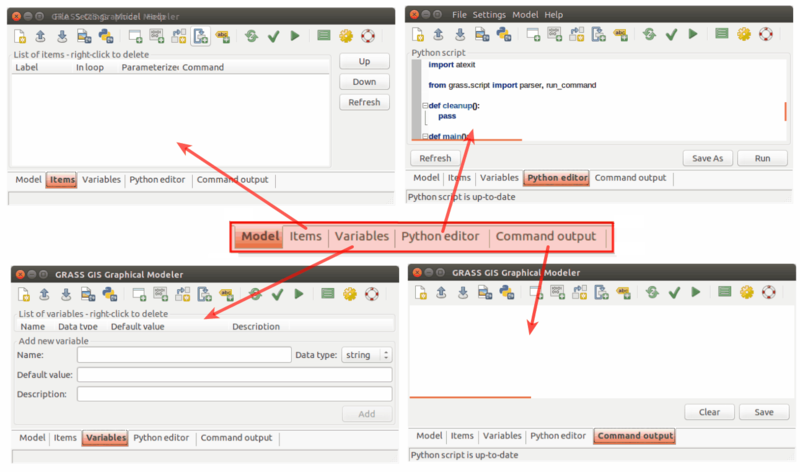 Python editor dialog window allows seeing performation written in Python code. Rightmost tab of bottom menu is automatically triggered when model is activated and shows all the steps of running GRASS modeler modules. In case of some errors in calculation process, it is written at that place. The workflow is usually established from four types of diagrams. Input and derived model data are usually represented with oval diagram. This type of model elements stores path to specific data on user's disk. It is possible to insert vector data, raster data, database tables, etc. Type of data is clear distinguishable in model by color. Different model elements are shown on the figures below. Figure: A model to perform creation of parametric maps used by geologists to predict landlides in area of interest. In this example zipcodes_wake vector data and elev_state_500m raster data from the North Carolina sample dataset (original raster and vector data) are used to calculate average elevation for every zone. Important part of the process is Graphical Modeler, namely it's possibilities of process automation. To start performing above steps as automatic process with Graphical Modeler press icon or type g.gui.gmodeler. 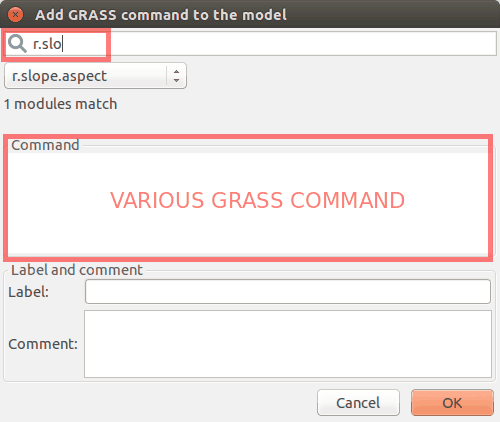 The simplest way of inserting elements is by adding complete GRASS command to Command field in GRASS command dialog (see figure below). With full text search one can faster module hunting. Then label and command can be added. In case that only module name is inserted, after Enter button pressing, module dialog window is displayed and it is possible to set all of usual module options (parameters and flags). All of used modules can be parameterized in model. That causes launching dialog with input options for model after model is run. In this example input layers (zipcodes_wake vector data and elev_state_500m raster data) are parameterized. Parameterized elements have a little thicker boarder in model scheme with diagrams. Figure: A model parameter settings. Final model, list of all model items, Python code window with Save and Run option are on figures below. The resultant model for Graphical Modeler is available here. Figure: Average elevation for zipcodes using North Carolina sample dataset as automatic calculation performed by Graphical Modeler. Very useful advantage is that for example, this model can later be used to calculate (let's say) average precipe value for every administrative region in Slovakia using precip raster data from Slovakia precipitation dataset and administration boundaries of Slovakia from Slovak Geoportal (only with a few clicks).